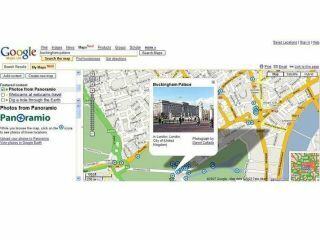 Google has introduced a feature on its Google Maps service that lets you create personalised maps. With Mapplets, you can show anything from the locations of shops in the area to videos of the destination. You can even include scenes of natural occurrences such as earthquakes. To access the mini-applications, you'll need to click on the newly-added ' My Maps ' tab. It's placed conveniently next to the 'Search Results' tab on the Google Maps web page. You can choose from over 100 mini-applications created by third-party software developers. The applications, including weather reports and hotel pricing, can then be overlaid on Google Maps and saved. One map application lets you watch YouTube videos from a particular destination. These range from personal video confessions to tourist videos of picturesque locations. You can also link and view photos from locations around the world, either through Google Maps or the Flickr Maps application. The latter links to the Flickr photo sharing service. "We are putting the web into maps," said John Hanke, a product manager for Google Maps. Multiple applications can be overlaid at the same time to find various geographical correlations. You can, for example, check out the crime statistics for an area if you're planning on buying a house. Or you can see how close the hotel you've picked really is to the beach, or what the surroundings look like. If you're registered with Google you can also save your personalised maps.